Kava, also called kava-kava, is made from the rootstock of a South Pacific plant, Piper methysticum. Used for hundreds of years in religious and social rituals of the Pacific Islands, kava is a relative newcomer to the United States—with a number of clinical studies confirming its use in relieving stress. For liquid preparations such as tinctures (alcohol extracts, 1 g per 5 ml in 60 percent ethanol), dosage ranges from 15 to 30 drops up to three times daily. 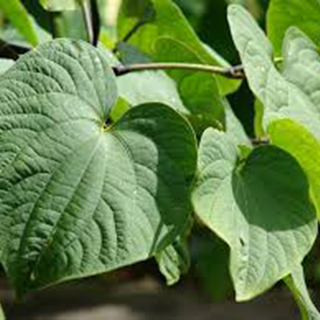 Kava plants don’t usually produce seeds and the flowering plants are actually sterile; so cuttings provide the normal method of planting the crop. This means dividing the root-mass or removing offshoots from the root-ball of the plant. You should plant in an area that receives shade and plenty of water – often surrounding a plantation with taller trees provides good shade and ensures a healthy crop. Although the harvest can be done at any time of year, it then takes another 3 years before the next roots are harvestable from the plant; but some farms only use the first generation root as this is seen as the finest quality.